On Wednesday 19 April we present a lecture by anthropologist Iwan Sewandono, on modern Indonesian painters in the Dutch East Indies in the 1930’s and after. The evening is part of the open lecture series in collaboration with the UvA chair of Dutch-Caribbean Literature, on the influence of colonialism and Dutch imperialism on (the relationship between) literature and visual arts, in connection to the former Dutch colonies. Iwan Sewandono (1945) was born in Buitenzorg/Bogor, in the then Dutch Indies. Sewandono studied Anthropology in Leiden and Amsterdam, and Public Administation at LSE. He worked in a few universities and as an organisation advisor in governance. In his lecture, Sewandono looks at how politics aiming at the cultural elevation of the European petty bourgeois class in the East Indies colony triggered the rise of modern Indonesian painting, which later contributed to the formation of a national Indonesian identity in the years of revolution and nation building. His argument focuses on how the colonial art world ‘outframed’ most modern Indonesian artists (1935-1965) and how, in spite of this, several young painters organized in the Persagi group, ingeniously worked their way inside the European art circles, such as the Kunstkring Museum owned by Jeanne de Loos-Haaxman (1881-1976). 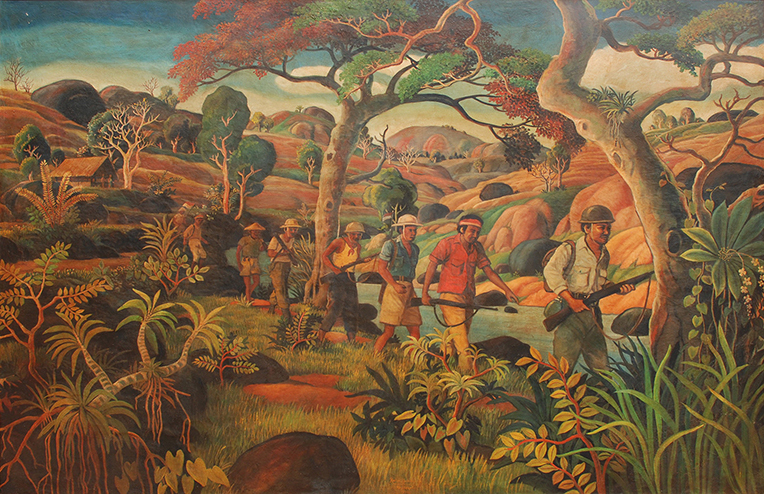 First Otto Djaya (1916-2002) and Sudjojono (1913-1986), later followed by the other Persagi members, were allowed to show their work and as autodidacts they took over the techniques of the great European painters in the famous Regnault collection. Later they established themselves in the capital of the revolution, Yogyakarta, at the side of Soekarno. After independence, in the years of Nation Building, president Sukarno (a great artlover and proficient painter himself) eagerly used their contributions to the formation of the national idea. Sewandono will illustrate this by showing and analyzing paintings of several modern Indonesian artists such as Otto Djaya, Sudjojono, Hendra Gunawan and Kartono Yudhokusomo.